WILLIS - (nee Finlay) - December 4, 2018 (peacefully) at South West Acute Hospital, Enniskillen, Margaret Vivian, late of Leginn House, Derrylin, beloved wife of Albert, dearly loved mother of Alan, Gordon (Jill) and Rodney (Joanne), devoted nanna of Alex, Hayden, Jake, Claudia and Emmalie and dear sister of Ethel, John and Robert. 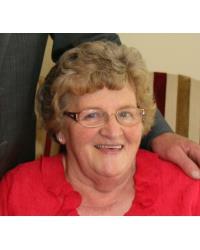 Funeral from her home on Thursday leaving at 1.15pm for service in Kinawley and Holy Trinity Parish Church, Derrylin, followed by burial in the adjoining Churchyard. Family flowers only, donations in lieu if desired to Kinawley and Holy Trinity Parish Church, Derrylin, cheques should be made payable to W T Morrison, Funeral Directors, 41 Darling Street, Enniskillen, BT74 7DP. Lovingly remembered by her family. I am sorry to tell you that Margaret Vivian WILLIS has passed away.